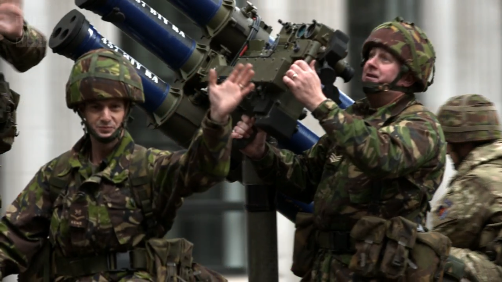 I have been engrossed by Turner Prize-winning Jeremy Deller‘s video installation English Magic. Produced as part of, and as a synthesis of, his Venice Biennale exhibition of the same name, the British artist’s work is a playful and visually profound statement on the state of the nation (particularly the English nation). The video is a 14-minute piece in four sections linked by three pieces of music played by a steel orchestra whose performance frames the entire work. 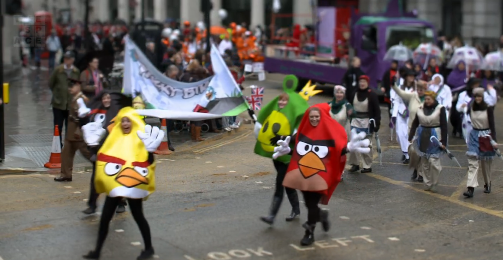 The four sections show birds of prey, vehicles being crushed, a ‘bouncy castle’ version of Stonehenge (an earlier Deller work), and the Lord Mayor of London’s parade, after which we return to the birds of prey. The three pieces of music are Vaughan Williams’ Symphony no. 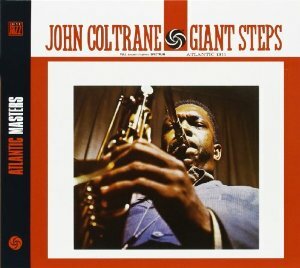 5, third movement; ‘Voodoo Ray’ by A Guy Called Gerard; and David Bowie’s ‘The Man Who Sold the World’. 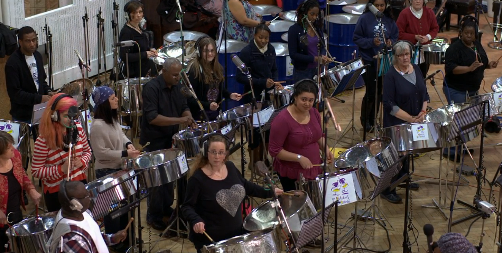 We begin by seeing the members of the Melodians Steel Orchestra setting up at Abbey Road studios. 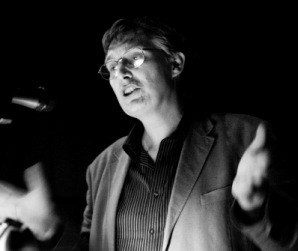 The conductor bids them to begin, and to the gentle, tremulous tones of the Vaughan Williams (played on steel drums as though the composer had always intended the instruments for his work) we cut to stunning slow motion images of various birds of prey swooping down towards a post against an almost idyllic countryside background (a road cuts through the middle of it). They are animals in the wild but also very obviously tamed – each bears the tethers to show they have been released by a trainer. The idea of tamed wildness sets us up for the remainder of the video. The music changes to ‘Voodoo Ray’ which (I have now learned) was an acid house record released in the late 1980s, but played once again by the steel orchestra, so that Vaughan Williams and acid house segue naturally into one another. The talons of the birds of prey have been replaced by the claw of a crane which lifts a Range Rover towards a crusher, thrillingly filmed from above in some shots, and continuing the visual delight of the pin-sharp imagery, even while we have moved from (apparently) tamed wildness to the banality of a crushing plant. In interviews, Deller has expressed his particular dislike for Range Rovers. He cites an incident where Prince Harry, or one of his entourage, is said to have shot at some birds of prey, presumably having been driven to the spot in such a vehicle, but it doesn’t need the specifics of such a story. The Range Rover itself says everything about a synthetic, privileged engagement – or disengagement – with nature. 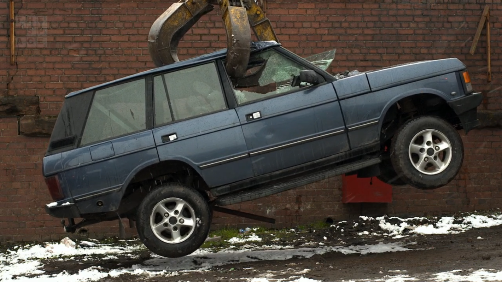 Deller gets his visual revenge by focussing with visual glee on a Range Rover being squeezed into oblivion. No image, it is clear, is accidental in this film. 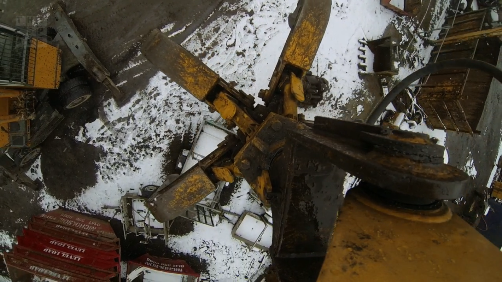 From the straps on the birds, to the make of car, to the snow at the crushing plant, to the absence (of course) of any greenery at the plant – everything is there to be read. 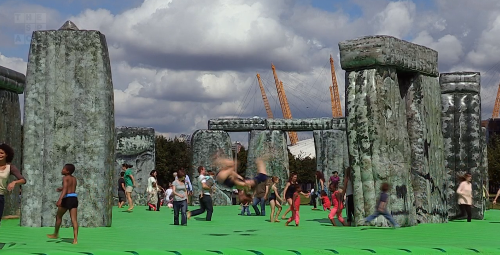 With ‘Voodoo Ray’ still playing, the scene changes to Deller’s Olympic year installation, ‘Sacrilege’, the piquant name he gave to a ‘bouncy castle’ version of Stonehenge. Stonehenge inflates, a large number of children (and some adults) gleefully jump on board and starting bouncing around, then they are filmed bouncing backwards, then Stonehenge deflates. The comment on the cheapening of heritage and the disconnect between modern lives and our past selves seems obvious enough. 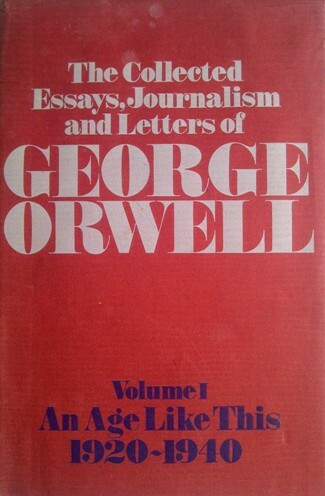 There are connections with other ‘state of nation’ exercises, however. In the background of some shots we see the O2 arena, which in another life was the venue for the 2000 Millennium Experience that so struggled to serve as a portrait of a nation that was no longer certain how it should be portrayed. And the narrative divided into sections that seek to re-imagine national heritage has echoes of Danny Boyce and Frank Cottrell Boyce’s opening ceremony for the 2012 Olympic Games. We see the Melodians readying themselves for their third piece. They are not how one expects a steel band to look at all. Multicultural in make-up, they look like a collection of ordinary people who just came in off the street, put down their shopping, and will now play the steel drums together in happy unison. The tune they are playing is David Bowie’s ‘The Man Who Sold the World’, and what we now see are scenes from the Lord Mayor’s Show, that bizarre spectacle in which representatives of assorted civic bodies parade through the city to bemusement of tourists and the scattered cheers of loyalists. There is much fun to be had in Deller’s choice of images. 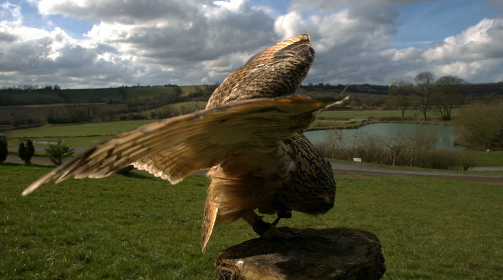 I particularly enjoyed spotting Angry Birds passing by, a knowing reference to the birds of prey we saw earlier. 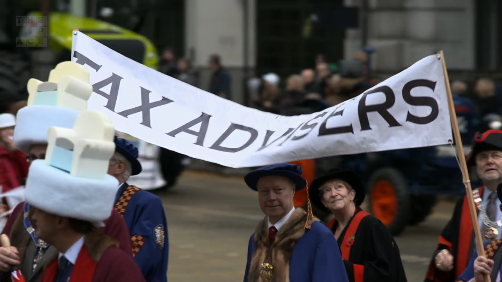 The satirical jabs at capitalism are blatant, from the use of Bowie’s song to the rather absurd parade of city types wearing silly hats and bearing banners that announce themselves to be actuaries, chartered secretaries and tax advisers. One wonders who it is in the crowd cheered as they went past. And then the Freemasons go by on an opened-topped bus. Little details intrigue and build up the picture – the man dressed as a bishop who grins to the crowd, then puts on a serious face and kisses his cross; the fierce-looking horses who would seem to prefer to go backwards rather than forwards (more wildness tamed). Nothing here is irrelevant. The parade sequence cuts between these exemplars of civic virtues and scenes of the military. It starts with a marching band with troops following, crisply shot with (I think) a tilt-shift lens arrangement to accentuate the focus. 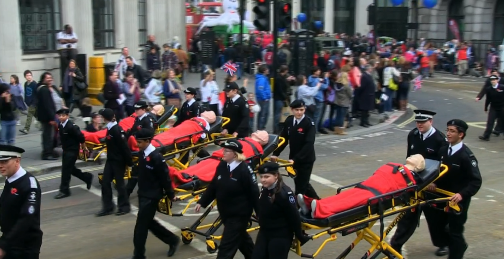 We cut back and forth to armoured vehicles, following immediately by a parade of hospital trolleys bearing dummy victims. Troops in battle fatigues wave cheerily to the crowd, and to us (probably Deller’s camera operator looked like just another happy tourist recording the parade for the folks back home). The parade goes by. The steel orchestra plays on with intense concentration, an harmonious paragon. 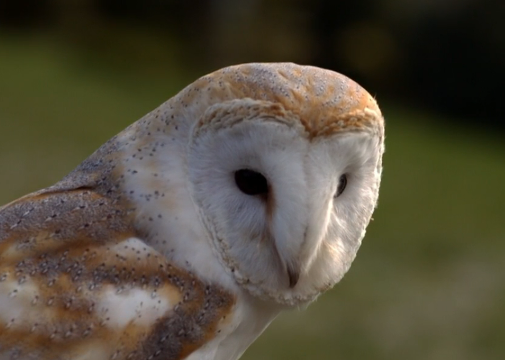 We return to the birds of prey, coming to land in their protected area. Maybe they think that they are wild, maybe they think that they are not. An owl stares at us, knowing something. A final shot looks down at the steel orchestra who have stopped playing, and look up anxiously as if to ask what happens next, knowing nothing. 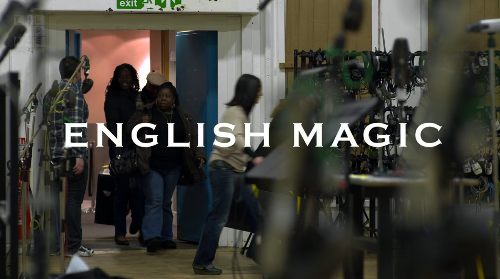 Following its Venice exhibition (which runs to 24 November 2013), UK audiences will be able to see ‘English Magic’ at the William Morris Gallery, London Borough of Waltham Forest, Bristol Museum and Art Gallery, and Turner Contemporary, Margate during 2014.